Offering low to nose-bleed cash stakes, plenty of Omaha and hold'em MTT options including All-in or Fold 4-max, and soon - Rush Poker, players can also enjoy special features like built-in tournament staking, run boards multiple times, all-in insurance, and built-in personalized HUD. 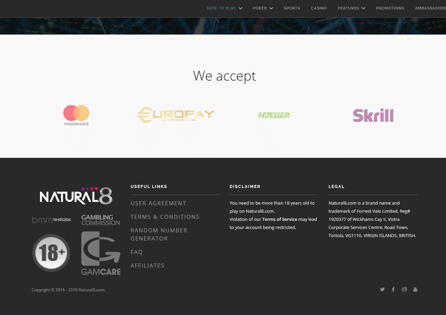 Natural8 is fast becoming a major player in Asia and Europe, offering poker, casino and sports. It prides itself as the best poker room on the GGNetwork, as well as the best online poker in Asia, where poker is booming. Natural8 is licensed by the UKGC and has headquarters based in the British Virgin Islands. The site offers cash and MTT options for low-rollers to high-rollers alike, catering primarily to the high-stakes community. They even have featured high-stakes hold'em and PLO games for players to showcase their skills for all to see. New players can enjoy a free $8 bonus for depositing at least $10, while also taking advantage of a 100% deposit bonus up to $1,688. This bonus, one of the best around by far, releases in $10 chunks at a rate of 20% of rake paid. So for every $50 paid in rake, $10 comes back into your account. While there is no time limit to collect the entire bonus, withdrawing funds from your account will end the bonus and forfeit any remaining bonus funds under the promotion. In addition to this generous deposit bonus, new players can also participate in $500 first depositors freerolls that occur weekly and are open to a limited number of players, making the chances of raking in some bonus cash even better. The wide range of cash game stakes offered at Natural8 is a big draw for players of all levels, with tables from $10NLHE ($0.05/$0.10) up to $20KNLHE ($100/$200) and $10PLO ($0.05/$0.10) up to $20KPLO ($100/$200). Players can choose between 6-max and full ring, and can even play in high stakes featured tables. Pretty soon, a Rush Poker variant will be available, Natural8's take on a fast-fold cash game. A wide range of hold'em and Omaha MTTs are also on offer, including an option to play in All-in or Fold 4-max tournaments. Natural8 is unique in many ways, offering plenty of special features to keep the game exciting. One one of the most exclusive features, one that really sets Natural8 apart, is the option to play in your browser. With the in-browser play, players don't have to download anything to play poker. Simply surf to Natural8 and sign in, you can post your first blinds within seconds of getting online! Another unique feature is a built-in staking option for MTTs, where players can buy action of other players on the site. This brings a classic poker element into the light, providing players with safe and transparent backing options online. The site also provides opportunities for players to increase or decrease their risk and variance. This is made possible by offering the straddle option for action junkies, as well as options to run boards multiple times and even buy all-in insurance for players who'd like to mitigate risk. For those curious cats, rabbit hunting is possible so players can see what would have been. Natural8 also has built-in personalized HUDs, making it easy for players to keep track of their own stats. Another convenience feature found on Natural8 are the countless deposit options including several forms of cryptocurrency, making depositing and withdrawing all the more smooth for customers.